Bake a round two layer cake the size that you need. Ice the cake with white buttercream icing using a cake spatula and making sure the surface is nice and smooth. With your white icing and round tip, size #5, do lace work on the sides of the cake. Change your tip to a star tip, size #18 and do a reverse shell border at the top edge of the cake. Using the same tip, make a regular shell border at the bottom edge of the sides of the cake. I took a picture of my granddaughter, enlarged it and cut it to an oval shape. I then laminated it on both sides with the self stick laminating sheets. 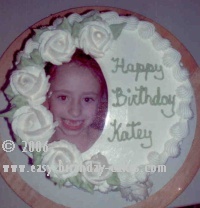 Place your picture on the cake. Make white roses using rose tip, size #125 and place them around half of the picture. I also placed one rose along the bottom edge of the cake in the front. Make a light green icing and use leaf tip, size #352 to make leaves around the outside edges of the roses. Change the tip to a round tip, size #5 and write the birthday message.